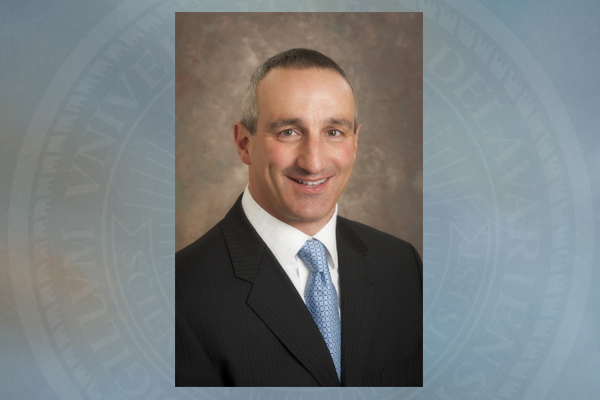 11 a.m., Dec. 21, 2015--Eric Ziady, director of Intercollegiate Athletics and Recreation Services at the University of Delaware since 2012, has announced that he is stepping down from his position, effective Dec. 31. "Throughout his time at UD, Eric Ziady has been committed to the comprehensive success of our student-athletes: on the playing field, in the classroom and in the community," Acting President Nancy Targett said. "He has overseen major improvements to athletic and recreation facilities that will serve all students on our campus for years to come. I know the entire campus joins me in wishing Eric well, and we thank him for his service to Delaware." Matthew Robinson, professor and director of the Sport Management Program in UD's Alfred Lerner College of Business and Economics, will serve as acting director of intercollegiate athletics and recreation services. Planning will begin in early 2016 to identify a permanent replacement, Targett said. During Ziady's tenure as director, Blue Hens teams won the CAA title and advanced to the NCAA Sweet 16 in women's basketball (2012-13); captured the CAA title and advanced to the NCAA Tournament in field hockey (2013, 2014 and 2015); earned an NCAA Tournament at-large berth in men's soccer (2013); captured the CAA men's basketball championship and advanced to the NCAA Tournament (2013-14); and won the school's first-ever CAA women's track and field team title in 2014. In addition, several Blue Hen head coaches have earned league or regional coach of the year honors. Under his guidance, Delaware made significant strides in facility upgrades and staff enhancements. In August 2013, the University completed a $25 million renovation and 18,000-square-foot addition project to the Carpenter Sports Building, the popular student recreation facility. Other major upgrades have included resurfacing Delaware Field House with Astroturf to make the facility the state's premiere all-season, all-purpose venue; a $2.5 million renovation and rededication of Bob Hannah Baseball Stadium that included the installation of a new turf field, dugouts, scoreboard, fencing, batting cages and bullpen areas; the resurfacing of two grass soccer practice fields; the installation of two turf practice fields; and a new all-weather outdoor track installed in 2014. In addition, thanks to a $1.5 million donation from Stuart and Suzanne Grant, the former UD Mini-Stadium underwent extensive renovations in the summer of 2014 that included new seating and a press box. The venue, home to the UD men's and women's soccer and women's outdoor track and field programs, was dedicated as Stuart & Suzanne Grant Stadium in November 2014. Overall athletics fundraising has also seen significant growth during his time at UD, surpassing the $4 million mark for the first time in 2013-14, reflecting a 91 percent increase from 2013. In addition, particular emphasis has been placed on the expansion of the alumni outreach and engagement infrastructure for all 21 of UD’s athletic programs, illustrated best by the successful $1 million campaign for the Hannah Stadium project spearheaded by former players, coaches and staff of Delaware Baseball. UD student athletes have achieved record academic success during his tenure as they collectively achieved a 3.024 grade point average for the 2014-15 academic year. In addition, they recorded their highest semester ever with a collective 3.025 in the spring semester, and 368 student athletes were named to UD’s Deans List during the 2014-15 academic year. Eleven Blue Hens teams were recognized by the NCAA in 2015 for achieving perfect single-year APR scores of 1000 during the 2013-14 academic year. State and community engagement has also been a point of emphasis under his guidance, as UD Athletics has incorporated the state branding “Blue Hen State of Mind” campaign since 2013. A number of statewide initiatives, including “Downstate Days” in Milford and Smyrna, have spread Blue Hens Athletics throughout the state in the form of football practices, youth clinics and fan activities. Collaborative efforts with the DIAA, the DFRC and the B+ Foundation have resulted in a number of significant state and community events being held on the UD campus, including bringing the state high school football championships back to Delaware Stadium. In spring 2015, the University of Delaware Athletics Department and adidas entered into an exclusive five-year partnership in which the Portland, Oregon, based company is the official athletic footwear, apparel and accessory brand of the Blue Hens. The agreement runs through the 2019-20 season and is the first all-sports deal in Blue Hens’ history. Before joining UD, Ziady spent 23 years working in the highest levels of collegiate athletics administration in the Boston area. He was at Boston College for 14 years, most recently as senior associate athletics director, and he spent nine years at Northeastern University, where he was assistant director of athletics during his final four years. A graduate of Providence College, he earned both a master's degree in sports management and a master of business administration degree from Northeastern. UD's athletics and recreation services department sponsors 21 intercollegiate sports, including 13 women’s sports, and annually ranks among the Colonial Athletic Association leaders in the NCAA Division I National Association of Collegiate Directors of Athletics (NACDA) Directors’ Cup standings. The recreation services department sponsors more than 30 club sports and over 30 intramural programs.